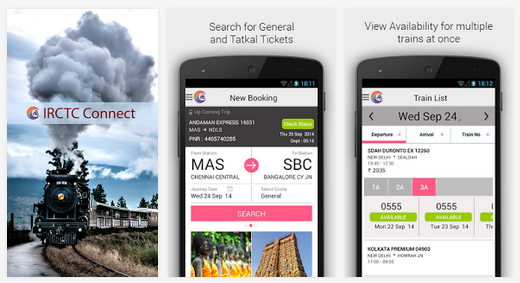 Now you could book a railway ticket anywhere in India at your fingertips as Indian Railway Catering and Tourism Corporation Limited (IRCTC) has launched their official Android application ‘IRCTC Connect’ on Google Play. The exixting users could login in one step and there is also option for new users to sign up. Easy to search and book train tickets. Existing ticket could be viewed and Cancel. You will get alerts for your upcoming journey. You could download the application from Google play if you are having android devices version 4.1 and above. The file size of the applicaion is 12 MB. Hope this android applicatin of IRCTC will be more convenient for booking train tickets and other Indian railway services. The IRCTC is one of the prime service providers for all railway passengers. One can easily book online tickets by doing IRCTC login. The post contains various nice point from which I was completely unaware from.